Kent Police is quadrupling the number of officers carrying Tasers. Any frontline officer will be able to choose Taser training and up to 1,500 officers are expected to opt in, with £750,000 initially allocated. Kent - which currently has 330 officers trained to use Tasers - said it was because of a large rise in knife crime. The Police Federation welcomed the provision of the "right equipment". Amnesty said it had serious concerns about Taser use in day-to-day policing. Ch Con Alan Pughsley said more officers had been recruited and deployed but added: "I am increasingly of the view that it isn't enough when we are dealing with violent county lines organised crime." He said during his time as chief constable he had steadily increased Taser availability to officers facing aggression and violence and he was "firmly of the view that it is now the right thing to do". There were 1,112 assaults on Kent officers in 2017-18, he added. Kent Police Federation chairman Chris Carter said the move would help keep the public safe and assist officers. He said: "Two officers per day are assaulted in Kent by violent thugs, and the scourge of knife crime and county lines criminality from London is increasing the risk." 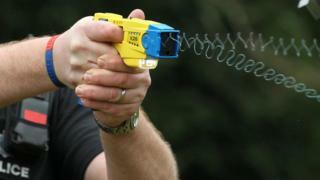 Oliver Feeley-Sprague, from Amnesty UK, said: "We've got serious concerns about the use of Tasers becoming the norm." Tasers had been linked to deaths, he said, and there had been over-use of the weapon against vulnerable and minority groups. He said: "More Tasers would inevitably mean more mistakes, more misuse and more tragedy."